As a 23-year-old test inspector for Marmon in 1911, Clessie Cummins jumped at the chance to crew for Ray Harroun’s Marmon Wasp at the inaugural Indianapolis 500, an experience that led the businessman to enter cars powered by his diesel engines in the famed race years later. 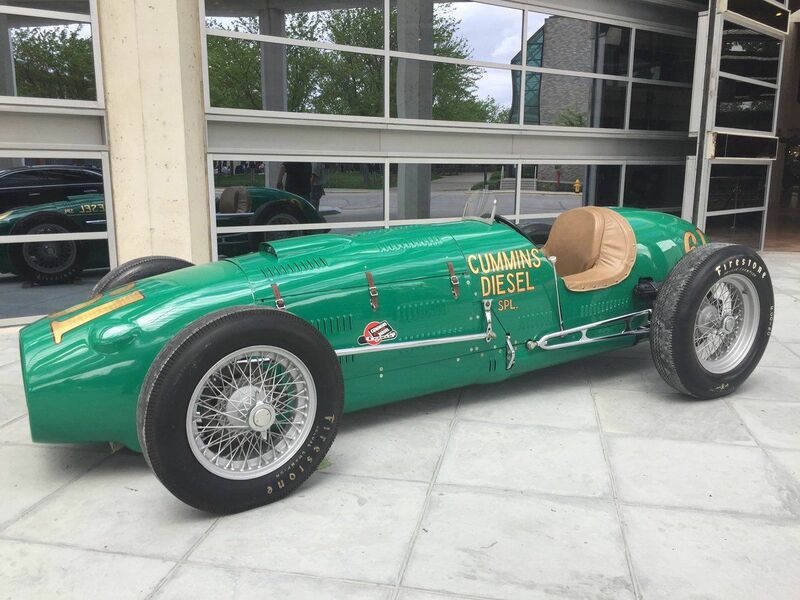 Now, as the Cummins diesel engine company celebrates its centennial, it has partnered with the Indianapolis Motor Speedway to gather all five of the company’s Indy cars on the track, the first time anybody has done so. That Packard not only convinced the backer to change his mind, thus saving the company, it also made a 35-mpg trip to New York for the 1930 auto show, raising a lot of eyebrows among Detroit executives, according to L. Spencer Riggs’ biography of Cummins in Automobile Quarterly Volume 34 Number 2. After two years of meetings, however, it became apparent to Cummins that none of the Detroit executives he met with knew exactly what to make of his diesel engines’ capabilities. So, “to keep the product before the public, Cummins embarked on what he called ‘a series of circus stunts,'” aided by the promotional efforts of his brother, Don Cummins. In 1930, he set a diesel land-speed record at 80.938 mph, but for 1931 he decided to return to his roots by entering a car at Indianapolis. The entry used a chassis that Fred Duesenberg designed around a Cummins Model U four-cylinder, possibly the same engine installed in both the Packard limousine and the land-speed cars. Its 381.5 cubic inches proved too large for the displacement limit at the time of 366 cubic inches, so Cummins sleeved the engine down to 360.8 cubic inches. 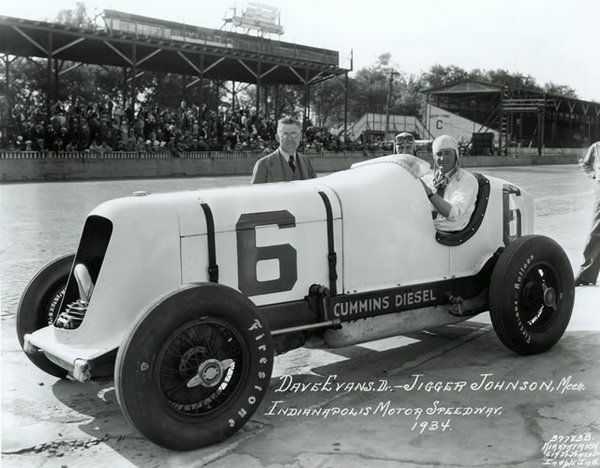 In February 1931, before racing the car at Indy, Cummins took it down to Daytona where it pushed that diesel land-speed record up to 100.755 mph. Then in May, with Dave Evans at the wheel, the No. 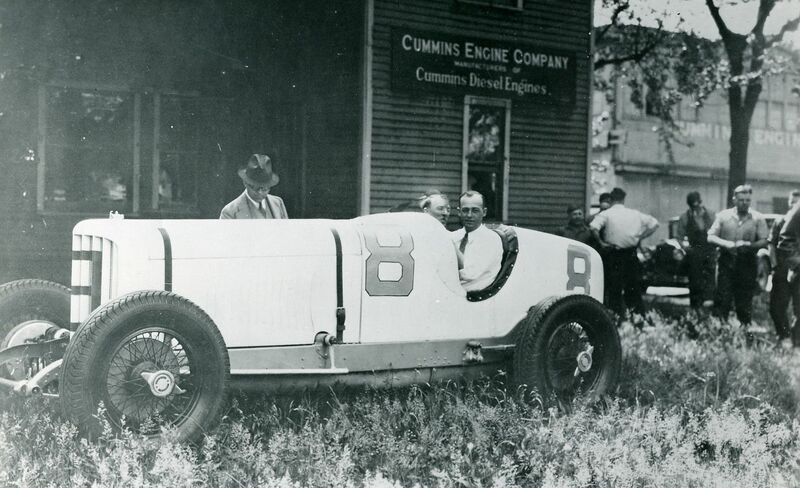 8 Cummins-engined Duesenberg finished in 13th place with an average speed of 86.107 mph. Given that only two other entries finished behind him, the finish would seem unremarkable except for the fact that Evans ran the race nonstop, needing neither fuel nor tires. 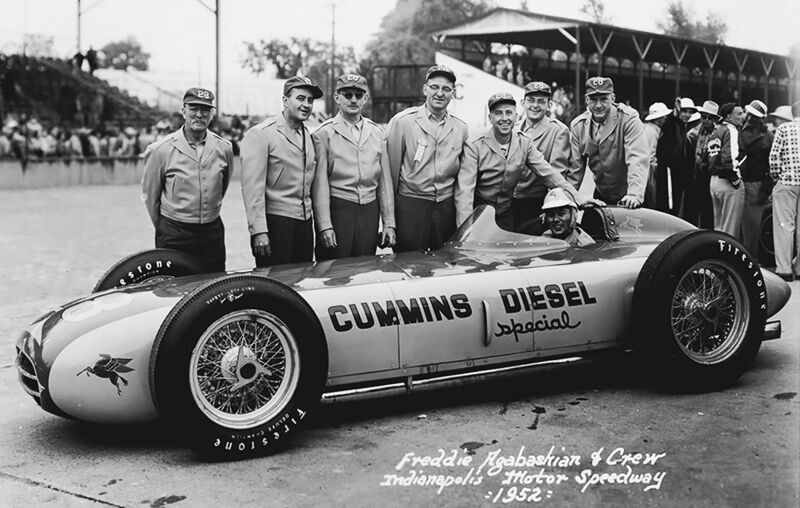 It was the first time in Indianapolis 500 history a car had accomplished that feat. Business started to pick up for Cummins, thanks more to another stunt that involved a Cummins-engined Indiana truck hauling the No. 8 racecar on a cross-country promotional tour. Truck manufacturers were still hesitant to make large purchases of the engines, however, so Cummins took another crack at Indy, this time with two cars in the 1934 race. Both sat atop Duesenberg chassis, and both used supercharged 363.8-cu.in. four-cylinder Cummins diesels, but one of the two engines featured an experimental two-stroke design. From that day on, both Clessie Cummins and his company swore off two-stroke diesels for good. Cummins subsequently placed a six-cylinder four-stroke diesel in the No. 5 car and sent it to Daytona in March 1935 to re-set the diesel land-speed record at 137.195 mph. 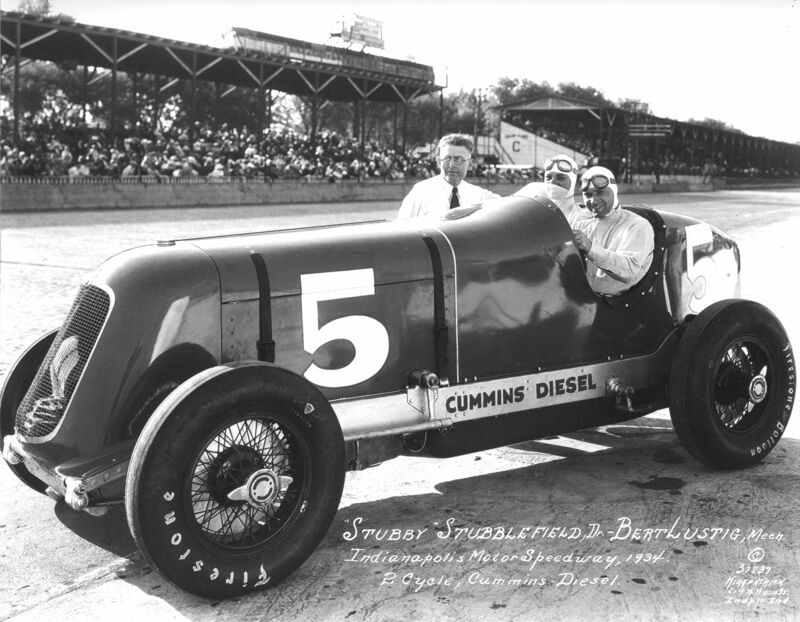 That didn’t mean Cummins — specifically Don Cummins — had lost interest in Indy. For 1950, he convinced Frank Kurtis to build a car powered by an all-aluminum four-valve supercharged version of the Cummins Model J 401-cu.in. six-cylinder diesel good for about 300 horsepower. Wearing No. 61 and with Jimmy Jackson at the wheel (and with the slowest qualifying time of that year’s entries), it lasted 52 laps before debris from a broken flange dropped into the supercharger. 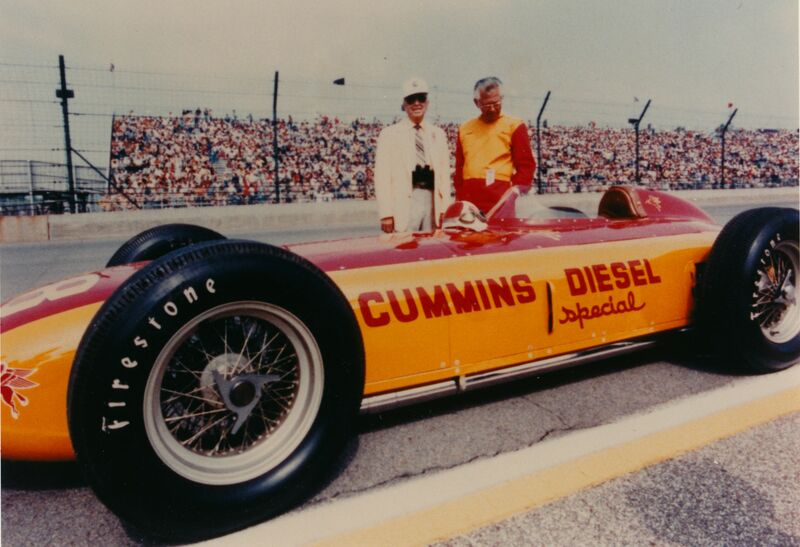 Two years later, Don Cummins spent half-a-million dollars commissioning Kurtis to build another car, this one a laydown design — the first in Indy history — powered by a turbocharged update of the aluminum Model J engine good for 430 horsepower. Wearing No. 28 and with Freddie Agabashian at the wheel, the low and sleek Cummins Diesel Special nabbed the pole for the 1952 race with a qualifying speed of 138.010 mph. However, it lasted all of 71 laps before the turbocharger sucked in enough track debris to sideline the car. Cummins officials, satisfied that they had proven a point, didn’t enter another car in the race. Besides, with the postwar road-building boom, they had all the business they needed selling engines not only for vehicles that laid down the country’s roads but also for vehicles that traversed those same roads. Still, Indianapolis Motor Speedway officials noted the role Cummins has played in the race’s history this past week when the two companies announced a multi-year sponsorship deal that will involve all five Cummins Indy cars running a parade lap before this year’s race. While the cars have appeared individually at events in the past, according to a Cummins spokesperson, the parade lap will mark the first time ever that all five cars have simultaneously run at an event. Four of the five remain in the Cummins collections, while the No. 8 car nowadays resides at the Indianapolis Motor Speedway Museum.